Growing up in the 1980’s in rural Georgia, the closest theme park was about a two-hour drive from where we lived. Luckily, we had a mall about 10 minutes away with a simulator in it that I was fascinated with. Does anyone else remember the Magic Motion Theater? Yes, for $5, I could hop inside a Magic Motion Theater located inside the Georgia Square Mall and go on a simulator ride that was pretty similar (in my eyes, back then) to what you could do in a theme park. 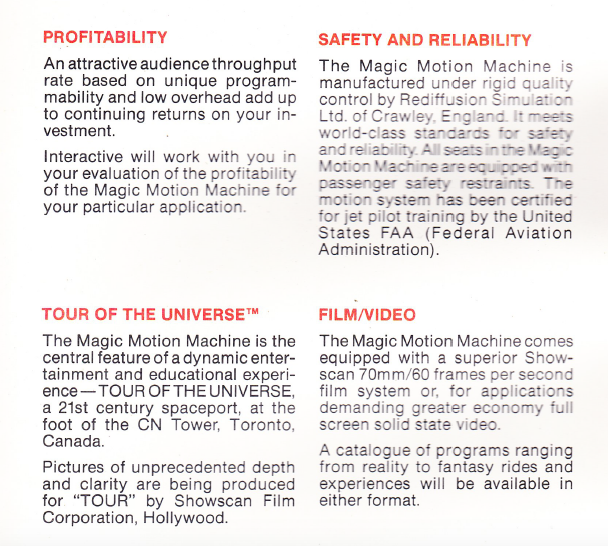 The images contained within this article is from a sales brochure for Magic Motion Theater from 1984. 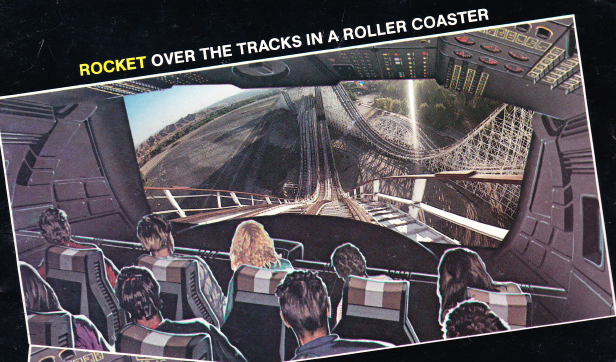 What I remember riding the most often was The Beast wooden roller coaster in virtual form! This was the next best thing since I wasn’t able to get to King’s Island in person! 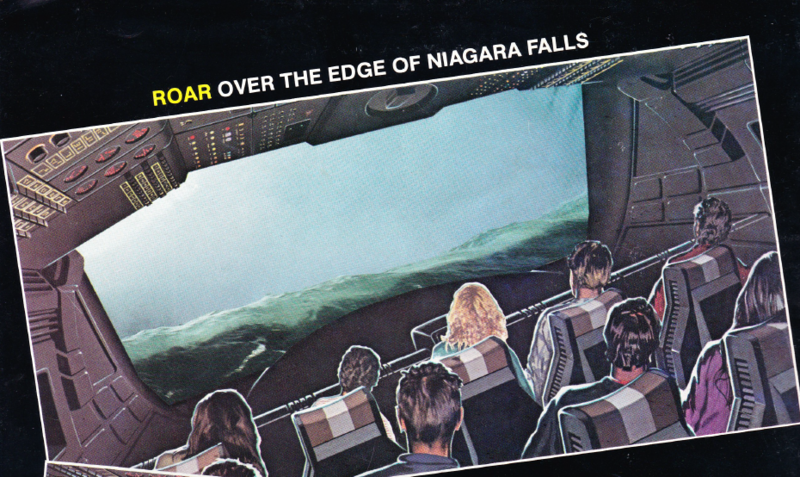 The outside of these attractions was just a standard simulator propped up on hydraulics (think about how Star Tours looks as you enter the cabin). However, from the image above the company clearly had higher hopes that it could end up looking like a dinosaur, space shuttle or even a roller coaster. What was great about these simulators was how many films they could have. There were adventures ready to go that they had already created or you could have your own designed if you were operating an existing attraction like a museum. How much did these films cost back in 1984? 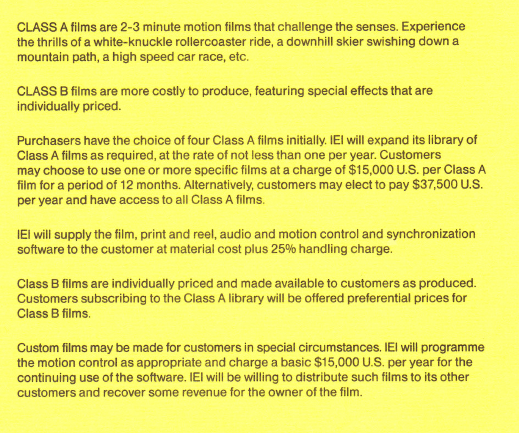 According to the brochure, $15,000-a-year would get you access to one of their Class A films that were already in their library and pre-programmed. Class B seemed to vary depending on what you wanted to be developed for you and your attraction. And if you were looking to get the technical specifications, they are listed above. 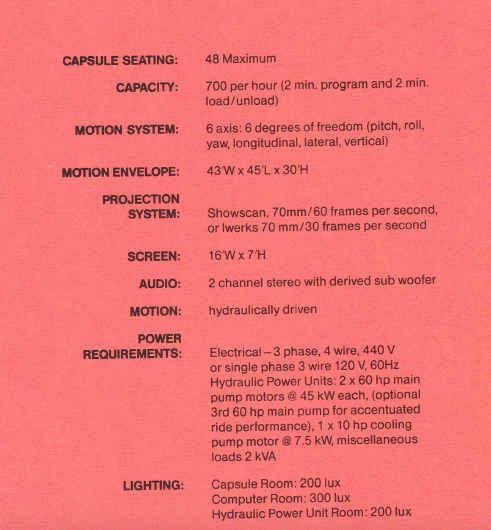 Notice that the Magic Motion Theater could use either Showscan or Iwerks projection systems. How many of you remember riding one of these back in the day? Do you have fond memories? Let me know on social media. ‘Tis the season for holiday shopping. If you’re doing any shopping on Amazon this holiday season, click on any of the Amazon links at Theme Park University before you do your holiday shopping or add this link to your bookmark list. This costs you NOTHING extra, but it helps support Theme Park University and we greatly appreciate it. This entry was posted in Theme Parks 101 and tagged King's Island, Magic Motion Theater, roller coaster, simulator, The Beast. Bookmark the permalink. Trackbacks are closed, but you can post a comment.